Having Trouble entering Custom Styles? Is the button not showing? There will be an error message where the add to cart button should be. Please follow directions to make the correct ink color selection. You must select the box "X" for No Ink. These types of stamps DO NOT come with a stamp pad or ink color choice. You must select a box for an Ink Color Choice. The button will reappear when ink colors are correctly selected. If you are having any trouble placing your order, please call us: 1-800-634-3717 (Monday - Friday 10:00 - 3:00 Central time). We will be more than happy to help you place your order. 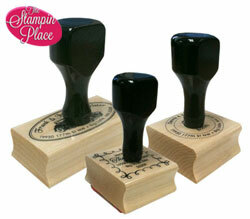 There are different types of mounts & materials to choose from when ordering a custom stamp style. If a mount option is not shown on a stamp style, then that mount does not work for the size/style. Rubber is the most durable type of stamping material. It is recommended for use with permanent or solvent inks. Our custom stamps are made to the highest quality standards. 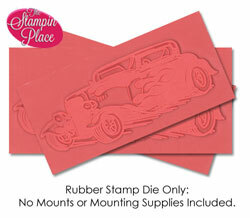 We have a few mount options available for Rubber Stamps. • High quality Maple Wood Mount with groove for easy handling. • Stamp design is indexed on top with a clear label. • No stamp pad included. • Handle added to top of mount. • No index or image on top of the mount. • Availabe to fit circle designs in the following diameters: 1", 1-1/4" & 1-1/2"
• Rubber Stamping Die only. • No Mount or Mounting Supplies included. 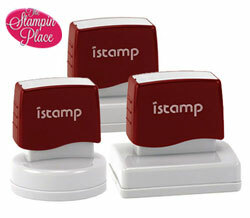 We also offer Self-Inking Mounts, Pre-ink Mounts & Clear Stamps in Custom Styles. • Ready to use! No stamp pad needed. • Ink is contained within the mount. • Reinkable Mount! Reinkers are available. 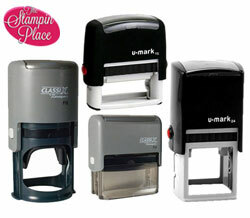 We carry a variety of Self-Inking mounts. The mount style may vary due to availability. 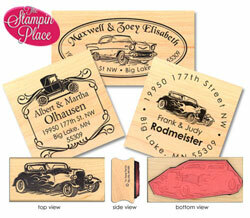 We use the best style for the shape of your custom stamp. This pre-inked stamp has an innovative design that offers solid construction, advanced re-inking system, and superb impressions. Its precise engineering creates a smooth and quiet action. The ergonomically designed handle offers the ease of use and helps create a solid, crisp and even impression. • Clear Custom Stamp with Acrylic Mount. What is a Clear Stamp? 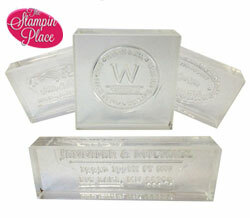 Clear Stamps are made out of a polymer material. An acrylic mount is included with each custom stamp. The clear stamp and see-thru acrylic mount allow for precision placement - you can see where you are stamping! More information Clear Stamp: Care, Cleaning, Storage & Use. If you select the PROOF option we will send a proof for your APPROVAL. A PROOF option is available, but is not necessary unless you have concerns that your text will not fit well or are requesting changes to the style. Your stamp WILL NOT be made until we have received response with your APPROVAL of PROOF. • Please allow 24-72 hours for receipt of proof. 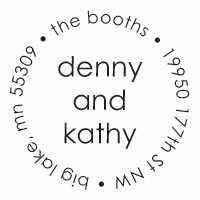 • A proof will be sent to you in an e-mail from info@stampin.com. • Please watch your junk/spam mail. If we do not hear from you, we will try to reach you by phone. • The proof will be in screen resolution: This is not a printable proof. The proof is for layout/content only. • If you need a revision on your proof, let us know by responding to the proof e-mail. • We will make up to 2 revisions for no additional cost. Knowing the differences between these types of mounts will help you make an informed decision on which will work best for you and your stamping needs. 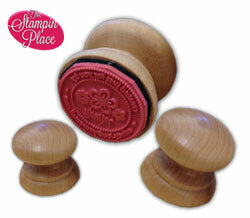 The stamping die flips around inside the unit to ink up the polymer stamp on the internal stamp pad. The ink is contained within the mount. The ink comes down through the stamping die. We do not recommend using solvent or permanent inks with this type of material. Good for stamping on paper. Not good for glossy or coated papers. After multiple impressions, this stamp will need a minute to rejuvenate the ink supply. Contact Us! or fill out a Custom Quote Request.